In this section of webpages is the reproduction of a small forty page A5-sized (7¾×9¾cm. or 5½×8½−inch) card-covered booklet that was originally issued by the Government Astronomer of New South Wales, Dr. Harley Wood at Sydney Observatory. Financially supported by the Donavan Trust, this booklet was originally one of several published editions that appeared during the Second World War (WWII). Both 1st & 2nd Edition were made during 1941, and the 3rd Edition in 1942. This greatly expanded version here is the last 4th version. Dr. Wood had produced all these works, which “was originally produced for boy scouts with its supplement to make the information more useful for military purposes.” This whole booklet became the important foundation for basic training and teaching of service personnel in the Australian Army, Navy and Air Force. Dr. Harley Wood had in New South Wales already made significant contributions as an educator, including teaching the basic principles of astronomy and how to use the sun, moon and stars for navigation purposes. The latter was both useful and important in wartime during nighttime manoeuvres or finding directions when combating the enemy, which often required stealth or camouflage, careful positioning of forces or attacks on the opposing forces under total darkness. This could save countless lives and the survival of individuals, platoons or squadrons. Carried onto the field of battle by one of the military unit’s leaders, this simply designed book was useful for basic navigation by infantry or sailors at sea. For example, the back cover (See Figure Left or the full sized image at the Bottom of Part 5.) along with the inside attached text) could be easily used for nighttime star navigation or find your bearings. It is a great tribute to its effectiveness, especially with the easy and concise language style use. Of course, the real advantage other than finding direction was also in using the Sun, Moon and stars to get an estimation of local time. Such advantages were applicable in knowing the expected time of local civil or nautical twilight. Advantages during the North African desert campaigns showed having some astronomical knowledge was valuable to army soldiers. No doubt, this booklet did mercifully saved many lives during WWII. In wartime Australia, the very real prospects of an expected Japanese invasion sometime during 1942 or 1943 meant that some understanding of navigation was required. All senior military commanders knew of the great inherent difficulties in having to defend the comparatively huge uninhabited expansive of the northern regions of the continent. So knowing where you and the enemy were positioned become very important. Strategists considered that most of these plausible engagements would not be major military engagements, but by protracted guerrilla-type warfare by much smaller squads. One of the biggest drawbacks for navigation in the Australian desert regions (The Outback) was the distinct lack of useable geological features, exacerbated due to the unavailability of accurate survey maps for much of inland Australia. 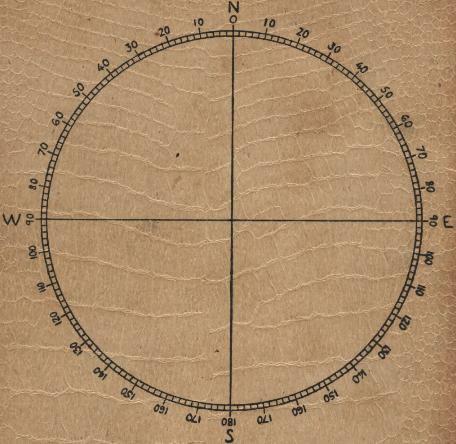 Furthermore, when using compasses for determination of the cardinal points were also troublesome, mostly credited to the distribution of magnetite-rich (Fe2O3) or hematite-rich (Fe2O4) iron ore deposits across the continent. On 27th January 1942, a formal request by the Australian Government to the Allied forces was made to protect mainland Australia to respond from a possible Japanese threat from the north. This lead to the creation of the naval ANZAC Force or ANZAC Command. After 22nd April 1942, this enabled force then became part of the new South West Pacific Area (command) (SWPA) directly under US Army commander, General Douglas Macarthur (1888-1964). From what I can determine, the first of these booklets were made during the time of ANZAC Command, when the Australia Government expected that they might have to defend mainland Australia on their own. With the Americans becoming involved in the defence of Australia, the emphasis changed to the Allied Forces. Although the immediate need for training encompasses many aspects of new knowledge and new skills, it seems the powers that be considered navigating by the stars important. I have reproduced the information (that I proudly have in my possession) as best I could from the original document. All the page background colours are as identical to the document as feasibly possible. I would have produced all the document pages as single images, however, the age and text font were difficult to reproduce very accurately, so I just typed everything. In addition, most of the figures are a little bit bigger than they should be, but the reproduction here is as close as I could get to the originals. Everything is as it appears, except for finding local ‘Sunrise and Sunset’ in “Fig.III.” Some of the errors mostly seem to be with the Government Printer Office who printed this booklet. A poor copy unfortunately has made the various times written on the graph quite eligible. Star charts attached in the last few pages of the booklet were later after in 1954 to appear in a dozen or so different books or publications over the years. I.e. The general astronomy book “Planets, Stars and Galaxies: Exploring our Environment in Space” by Harley Wood (1973). I am unsure if anyone has claimed copyright on them, however, the star charts here have been reproduced from the original document and background, whose copyright has long since lapsed. These charts do have some personal meaning to me. I can still recall, many years ago, using these star charts in the separate booklet entitled ‘Star Charts’ (and the text of this appears as a separate addendum.) In my early teenage years, this was made far more special in having Dr. Wood personally giving me my own copy on my first visit to Sydney Observatory! Thankfully, these charts only go down to 4th magnitude, as this is just above the sky brightness limit from the inner suburbs of Sydney. In all, much of the information presented is still quite relevant some sixty years later (2005) though the written style is slightly antiquated. I am quite unsure who might like to read this booklet — but it will certainly remind those who were scouts or those who did active military service. Perhaps if you read this, you could send me a short e-mail, reflecting on the times of this written document or even some short positive comment. Towards the beginner, having navigational knowledge in using the stars, sun or moon these days is rarely, if ever, needed. To find your way now just requires the generally available GPS satellite navigation devices and/or a mobile phone, and you can never be lost or not know where you are. Stellar navigation as an art seems almost redundant. Although the sprawl of urban environments encroaches upon us making it more difficult to see the stars, nevertheless, if you do know the sky, then during fine weather you will never find yourself in completely unfamiliar surroundings. The best part is you will be always be in familiar and friendly environment and this will enable you to orientate yourself regardless of where you are. As reflected in the contents of this little booklet, such knowledge will be easy to grasp as while you read it and see the stars for yourself. NOTE: Text written as [*NN] is the page number in the original document. In true remembrance of so many of our ANZAC mates that lost their lives during war, we do humbly in gratitude remember those who paid the ultimate sacrifice so we can continue to enjoy our freedoms — against tyranny, the dark shadows of evil, and those who wish to enslave us. Like many of my fellow Australians and New Zealanders, and those peoples of the world who share the same ideals — we will always remain so eternally grateful. “They shall not grow old, as we who are left grow old.